← Who Was Jackie Robinson? Nelson Mandela has many different claims to fame. Most notably, he was a struggle icon and revolutionary against apartheid that plagued the Republic of South Africa for many years. He studied and practiced law before and during his years as a political activist. As a result, he served 27 years in prison for acts of treason that he entered into primarily as the leader of the ANC (African National Congress) which at the time was a national liberation movement and has since become the ruling political party in South Africa. His sentence was later declared wrongful incarceration. 18 years of his incarceration were spent on Robben Island where he continued his education. After this he was sent to Paulsmoor Prison with a number of his struggle comrades from where the process of negotiating peace and the end of apartheid began. He would complete his sentence under house arrest while continuing his efforts to attain equal rights for all citizens of South Africa. This not only resulted in the abolition of the repressive apartheid structure but also awarded him the Nobel Peace Prize in conjunction with then President FW De Klerk who negotiated the peace process with Mr. Mandela. 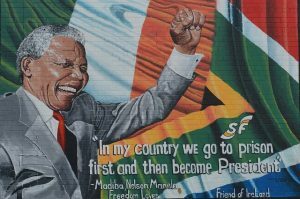 After the first free elections in 1994, Mandela was voted in as President of the country for 5 years at the age of 84 years. During this time, he implemented many reforms to the government until he stepped down in 1999. But his work as a human rights activist did not stop there except that his focus changed mainly in the direction of promoting the value of education. He was a philanthropist who started many of his own charities to promote education as well as health care for children and the poverty stricken, previously disadvantaged population of South Africa and those around the world. He is also the only person who has had a day dedicated to his efforts to promote peace and reconciliation, gender and race equality, protection of human rights and much more. His birthday, 18 July was declared International Nelson Mandela day in 2009 by the UN Assembly. Every year on this day, people around the world are asked to find ways in which they can positively impact their own communities. The import of the day was also extended to include the promotion of humane treatment of prisoners across the world as part of the UN resolution through the revision of the Standard Minimum Rules for the Treatment of Prisoners. Nelson Mandela passed away on the 5th of December 2005 and will be dearly remembered for all his work by people across the world. Comments Off on Who Was Nelson Mandela?